Sailing Croatia: Dubrovnik to Split – These Two Eyes! Prior to sailing the Dalmatian Coast of Croatia I had visions of wild nights dancing on a yacht with drink in hand while lounging in the Adriatic by day, the warm sun on my face and my feet overhanging a round floaty staring out at ancient ruins. The challenge of fulfilling this prophecy, or so I thought, was that I had a hard timeline of pre-35 years old. I envisioned sunbathing, day drinking, dance parties and rambunctious nights with friendly strangers. But somehow venturing to Croatia got pushed back on my bucket list each year due to Indonesia, Japan, Malaysia, New Zealand, America and others. I wasn’t getting any younger but I’m not complaining because this year was going to be my year. But I also had fears. I read review after review in preparation about Sail Croatia, Katarina Line and group bookings on Busabout and Contiki. It wasn’t just the age cut-off that made me nervous but realistically the demographic for the party boats are 18-year-old gap year students and immature Aussies their first time abroad. There were rumors of theft, 24-hour raves and claustrophobic, stifling hot cabins below deck with a mere porthole. My dream vacation and what was on offer were seriously disconnected. But when it came time to prepare, my agenda slowly evolved from dance party to luxury yacht. Traveling with my sister made it easy to compromise as well. At first we said that a private bathroom was a must, of course. Then the cabin must be on the deck, not below. Oh yes, and air-conditioning was a requirement as it will be about 104°F (40°C). So, we unintentionally priced ourselves out of the backpacker options and found ourselves in an A+ cabin on a 5-night Dubrovnik to Split cruise with Katarina Line unknowingly upgraded to the brand new deluxe yacht M.V. Admiral. I didn’t complain. I then fell in love with Croatia. It’s medieval architecture and passionate culture. The friendliness of the people, their excellent English and hospitality thrive on tourism, which meant that service was exquisite and opportunities to engage endless. “We’re not yelling we’re just Croatian,” explained Miho, our complimentary tour guide who navigated us through the walled city of Dubrovnik, stopping every few minutes to explain the culture, architecture and history, including the horror of the very recent Croatian War of Independence in the early 90’s. The sun-faded terracotta roofs of Dubrovnik overlay the old city within a fortress created by century aged city walls. Everything is stone, the houses, the streets, the walls, the shops. It has seen many battles and yet looks effortlessly rebuilt to maintain its native charm, keeping tradition with every new burnt orange tile replacing a bombed out rooftop. At night the squares come alive with traditional music, as both tourists and locals sip Ožujsko beers and wait for the sun to set late in the evening to escape the scorching summer heat. We found refuge in D’vino Wine Bar our first night. It’s here that we first learned about Croatian wines, the forefront of every meal. Our tasting flight of reds included the local grape plavac mali, and the 3 variations of plavac, postup, and dingac – each named and uniquely produced based on the position their vines grow, changing from light and fruity to full bodied and sweet as the sun reflects off the rocky coastline and Adriatic sea. 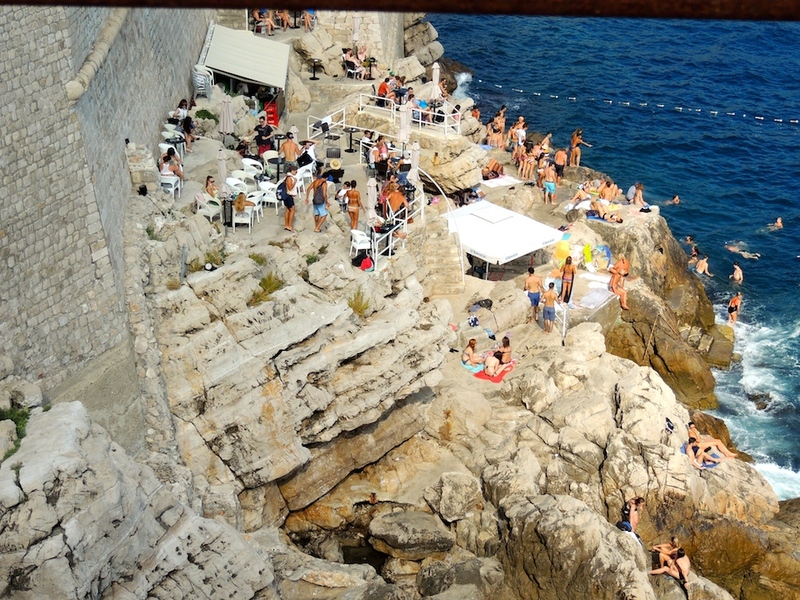 After walking the city walls we thankfully relaxed in Buza Bar, a cliffside bar of tourists and locals sipping cocktails amongst the rocky coastal boulders and taking refuge in the accompanying sea. We stopped off our second night in what is jokingly termed the New York of Croatia. Trstenik is a small fishing village of approximate 56 people, and that’s during the high season. Sadly a local had set fire to the vineyards in the surrounding hillsides and tragically this village will be devastated for tourism for the next 15 or so years. Nik and I stopped in its small, family owned wine store šunj vina to taste their famed plavac mali and purchased a few mementos to contribute to the economic disaster. The piping hot sun would slowly roast our bodies while relaxing on the boat’s top deck, my skin darkening a new shade as each new day passed. After lunch we would pull into a new quiet alcove, the turquoise water so crystal clear you could see the dead coral and black sea urchins on the bottom while taking a welcome relief from the fiery heat. When it came time to dock in a new port midafternoon the Captain would park his shiny toy, carefully maneuvering next to the last ship to arrive, creating a massive obstacle course. Guests were expected to, what I termed “walk the plank,” or scarily step over the massive gap from ship to ship to reach the port. There were stories confirmed that people from time to time have missed the gap (likely due to being heavily intoxicated) but regardless, it was always a bit nerve racking and frankly not disabled friendly. In the small, fishbone-shaped town of Korčula, the much disputed birth place of Marco Polo, we were introduced to the island’s native white wine varieties pošip and grk, in which the latter’s vines are so unique being all female it can’t replicate itself. We climbed the narrow, wooden ladder to the top of an ancient tower to sip cocktails at Massimo, attended an unimpressive (due to the lack of wine education involved) sit down wine tasting at an upmarket hotel, and then attempted to party with the backpackers at a disco leaving disappointed with a Croatian pita kebab in hand. I uncovered then that my favorite pastime from this trip so far was just aimlessly wondering and getting lost amongst the antiquated streets by day. Beyonce put Hvar on the map with her visit in 2011 making this small seaside town the “it” holiday destination for jetsetters. Private luxury yachts, world class cuisine and nightlife and a view from the top of the Spanish Fortica would make any friend ooze with jealousy. We found haven in Wine Bar Pršuta 3 to the sound of rock music and free wifi while dabbling in their best pošip and later nibbling on Dalmatian prosciutto, olives and fresh seafood. 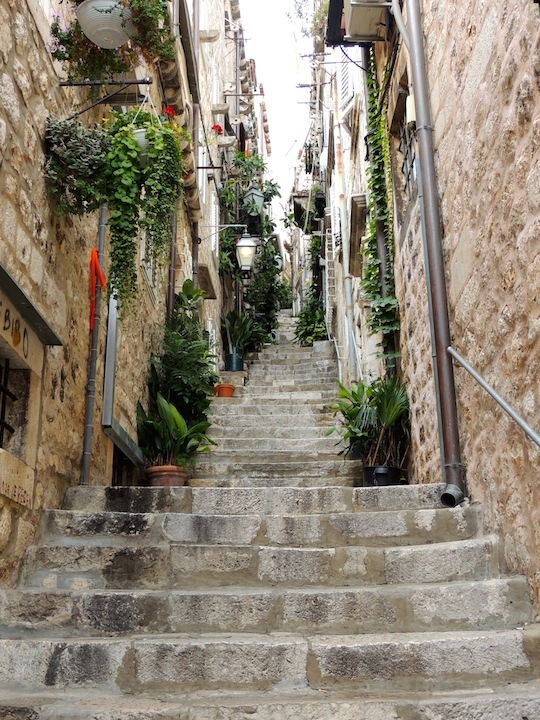 Our journey ended in Split, the second largest city in Croatia where we were told by a stout 9-year-old boy that we could not pass through while navigating the ancient rubble of Diocletian’s Palace as a casual game of soccer amongst the local boys was being held. We devoured cone after cone of gelato, tasted variations of olive oil at Uje Oil Bar, had the best pistachio gnocchi of my life at modern bistro Bokeria and then mingled amongst the ivy and graffiti with regulars at the funky bar Academia Club Ghetto. The service, cheese selection and wine list at Paradox Wine & Cheese Bar was unparalleled. Our boutique accommodation, a 25-minute stroll from the port, at Divota Apartment Hotel was the quiet serenity we needed to close out the trip. 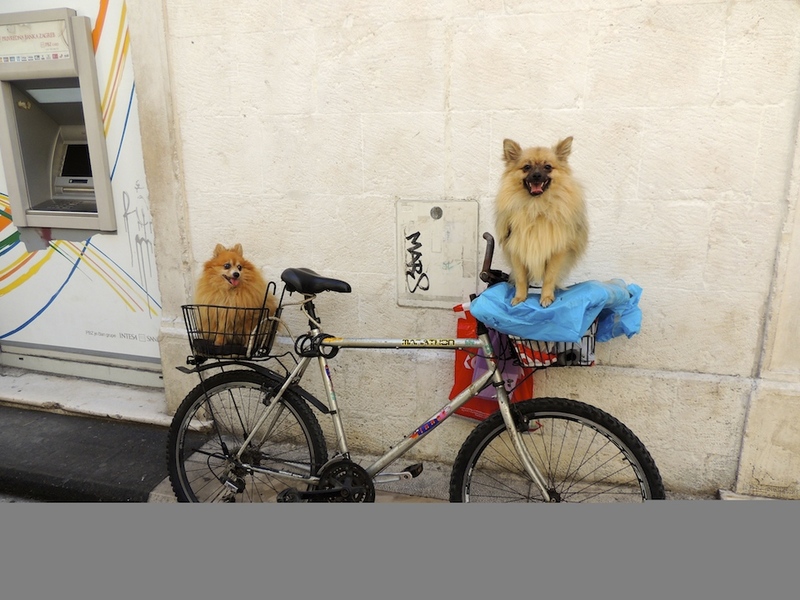 We rented eco bikes for the day, and squealed with glee as we peddled a few rounds then zoomed off on our motorized cycle, speeding up hills as we wove through the thick trees of Marjan Forest Park and passed renaissance hermitage caves built into the seaside cliffs. Far from modest sunbathers were scattered along the rocky coast, resting on any flat surface to embrace the warm summer sun and refreshing pools along the bay. Departing from Split airport, the carnage of the party boats was present in every corner of the small international terminal, as hungover bodies were strewn across the terminal gate floors and the line to purchase a simple bottle of water was a 25 minute wait. It was then that I reflected back on the M.V. Admiral and smiled with no regrets. As always, I felt like I was right beside you the whole trip. I wanted to be on the motor bike and race with you and Nik and watch you jump across the “plank”, teasing you that you would probably fall in. Excellent blog as always, I was on the edge of my seat reading and wanting to share with the person across the hall from me. Thanks Ab! Wish you were with us too!